This impressive villa is located in La Mola, one of the most luxurious and exclusive residential areas with stunning sea views. The proximity to shops, restaurants and exclusive boutiques makes it easy to enjoy the best Port Andratx has to offer. The villa was built in 2003 in a Mediterranean style on a spacious plot with several terraces. 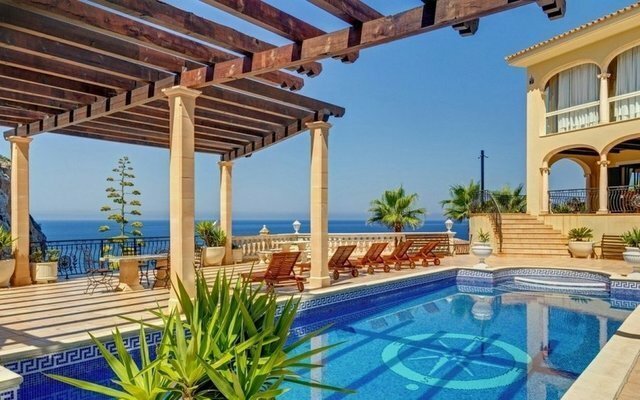 This beautiful villa consists of a fantastic entrance hall with a staircase leading to the first floor, 7 bedrooms with en-suite bathrooms, large living and dining room, study and a fully equipped kitchen. There are separate guest and service apartments, garage for 2 cars, pool house, sauna and a beautiful pool on the main terrace. Additionally, the villa offers maximum privacy and security with a fence and cameras around the plot and two Buckingham Palace replica gates, several storage rooms, elevator from the garage to the first floor and a small garden to grow vegetables in.